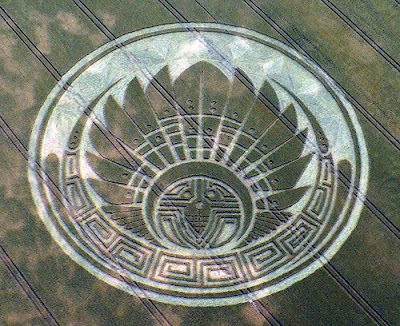 On the 5th of July, 2009 one of the most exquisite crop circles was reported at Silbury Hill, near Avebury Wiltshire which closely resembles a Native Headdress or Quetzalcoatl's Headdress as some believe, since it bears prominent maya symbolism and in some deep way relates to the fabled return of the feathered serpent and the evolutionary shift underway. The pine cone does seem symbolic of the 3rd Eye or Pineal Gland and is perhaps a direct reference to what the feathered headdress meant to the ancients. Here is a brilliant article which describes the significance of the feathered headdress and how it relates to the flow of chi and awakening of the Kundalini Shakti. The Eagle, considered the messenger to the Creator, plays a significant spiritual role in the American Indian tradition. The Golden Eagle Feather was a revered possession that instilled great respect among the members of the tribe and retained a prominent place, not only in the Four Sacred Rituals, but also in the Native Indian headdress worn at such ceremonies. "When the world was new, the Creator made all the birds. He coloured their feathers like a bouquet of flowers. The Creator then gave each a distinct song to sing. The Creator instructed the birds to greet each new day with a chorus of their songs. Of all the birds, our Creator chose the Eagle to be the leader. The Eagle flies the highest and sees the furthest of all creatures. The Eagle is a messenger to the Creator. During the Four Sacred Rituals we will wear an Eagle Feather in our hair. To wear or to hold the Eagle Feather causes our Creator to take immediate notice. With the Eagle Feather the Creator is honored in the highest. When one receives an Eagle Feather that person is being acknowledged with gratitude, with love, and with ultimate respect. That feather must have sacred tobacco burnt for it. In this way the Eagle and the Creator are notified of the name of the new Eagle Feather holder. The holder of the Eagle Feather must ensure that anything that changes the natural state of one's mind (Alcohol and Drugs) must never come in contact with the sacred Eagle Feather. The Keeper of the feather will make a little home where the feather will be kept. The Eagle Feather must be fed. You feed the Eagle Feather by holding or wearing the feather at sacred ceremonies. By doing this the Eagle Feather is recharged with sacred energy. "When many of us picture Native Americans, we see a stately chief, standing tall wearing a large feathered headdress. The headdress is a very important part of Native American culture. Typically made of beautiful bird feathers, it is more symbolic than anything else. The Sioux were thought to be one of the first Native American tribes to use these head pieces. Not everyone among the tribe could wear one, however. The Native American headdress was reserved for the most powerful and influential among the tribe. Perhaps there is meaning then as to why we usually picture the chief wearing one. It is a little known fact that Native American headdresses were not made completely in one sitting. In fact, each time the chief, warrior, or other important tribe member committed a brave act, a feather was added. Therefore, the more feathers in the headdress, the braver...the wearer was. In certain tribes, the brave act itself was not enough. The warrior would have to provide [prepare] himself by fasting for several days and meditating the entire time to show his steadfastness. This fact alone makes the significance of the Native American headdress very important. It is also a very surprising and little known fact that women did not participate in making the Native American headdress. Only the men would help to make them, and this was often made by the chief or warrior's closest friends and allies. Of all the feathers, the Golden Eagle feather was the most coveted and the most significant. If someone had one of these in their headdress, they received a great deal of reverence and respect from other members of the tribe. The Native American headdress can be many colors at once, or can consist of several feathers of one singular color. This often depends on what birds were indigenous to the area in which the tribe lived. For example, those living in the desert may only have feathers of one or two particular species of bird, while those living in the forests would have several colors. The strap that held the Native American headdress stationary on the head was usually made of leather or deer sinew. Sometimes cloth would be used to improvise, but typically leather was the material of choice. The back of the headdress was usually tied together, allowing the headdress to be adjusted fairly easily. Today, we see the Native American headdress as symbol of strength and bravery... Wearing a Native American headdress was a real honor, and those who got the opportunity to wear one were revered and respected." "Quetzalcoatl, the feathered or plumed serpent, represents kundalini which is the movement of energy from the Earth to the base of the spine, then up the spine. This serpent/fire represents transcendence. Quetzalcoatl, "The whole American continent is represented by an eagle or condor. It(America) has been called to take the torch for these times. One wing represents the physical and the other the material. The spiritual wing must continue to lift. When balance comes of both wings, then America will come unto its own, bringing the spiritual and material resources together." "Awakening Quetzalcoatl/Kulkulcan: The Seven Powers of the Serpent"
In the Mayan religion, the serpent symbolically represents the seven powers of light, energies distributed throughout the body as a gift of the Giver of Movement and Measure, Hunab K'u (the Creator). The seven powers combined and awakened form a circuit of energy focused through the crown of the head to join in the Dance and Flow of energies of the Creator. This flowering of energy through the crown chakra was often depicted through brightly feathered headdresses for the priests. The legends of Quetzalcoatl are that he would appear as a rainbowed serpent with a crown or ruff of brightly colored feathers, as a macaw, or as a man with feathers waving from the top of his head - the headdresses of the priests imitated and honored the feathered coif of both the serpent and the humanoid form. 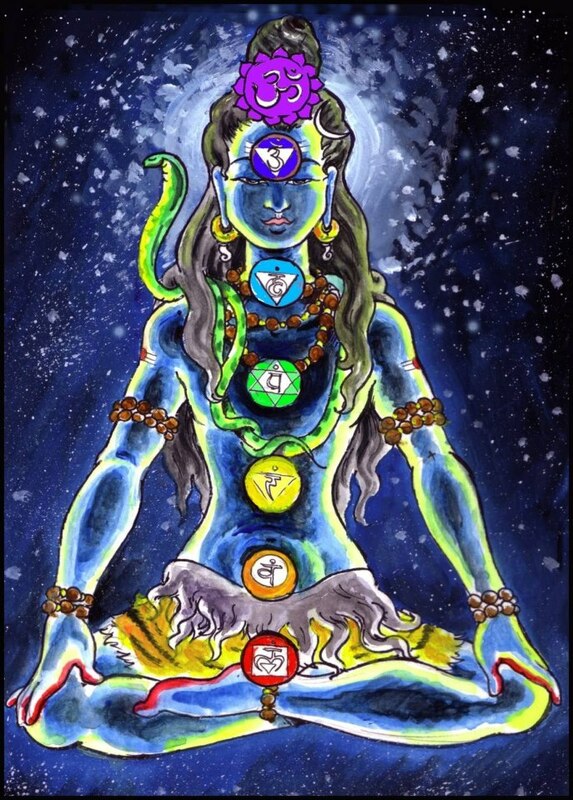 The Hindu seven chakras match and are the same as the Mayan seven powers of light. The Mayan colors for these power centers are different, being the wavelengths/colors of the rainbow flowing upwards from red at the base chakra to violet at the crown. These seven colors together form the light of the sun, and the rainbow gives the pathway and seven steps upwards through the seven power points of "light" located within the human body. The water and air (rain/mist)break the light of the sun into the seven separate colors/powers. 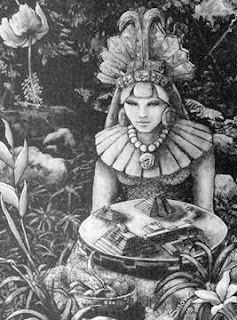 The Mayans had specific words to use to awaken these powers. Kulkulcan is a combination of k'ul (sacred vibrations), and can (sacred teaching). The energy radiating from the crown chakra (often symbolized by feathers) is cizin. Inlilnaluk' translates as "to receive sacred knowledge (literally self/vibration/mount/swallow)" and lol is "relationship between vibration and spirit". The beginning colors of the seven powers of light, red flowing into orange, is considered the color(s) of the galactic force (Milky Way Galaxy); the word for that color combination/force/energy is chacla." Not only did a warrior earn a feather upon carrying out a worthy act of bravery, but he was also the respected recipient of the revered Golden Eagle feather upon first being viewed as an adult member of the tribe. However, such an honor was bestowed only after days of fasting and meditation in preparation for this honor. "Each time the warrior earned a feather, he would either wear it (but he only wore a couple into battle) or put it on a pole used for special occasions. Once he had collected enough feathers, they were then made into a headdress. Because each feather had a special meaning, binding them together in a headdress made that Indian headdress even more special. Only the men, closest friends of the warrior, were involved in making the headdress. The Indian chiefs also "earned" each of their feathers. The most prized of all feathers to receive for an Indian headdress was the Golden Eagle feather. Because the Indians saw the eagle as a messenger of God, this feather could only be earned through hardship, loyalty, and strength." With the knowledge, then, that the Native Indians were already meditating in order to prepare themselves for receipt of the revered Eagle Feather, which had an honored place in the treasured headdress worn by many different tribes, it is also therefore fascinating to realize that the Native American headdress, according to Shri Mataji Nirmala Devi, actually represents the Sahasrara!!! - the Sahasrara called the 1000-petalled Lotus by the Hindus, the Gems in His Crown by the Christians, the Niche of Lights in Islam, the Sahasrarapadma in Buddhism, and the Dsam Duar in Sikhism! Self-Realization occurs with the awakening of the Kundalini from its abode in the os sacrum, then rising through the Sushumna channel and finally piercing the fontanel bone at the Sahasrara. The proof that Baptism has occurred is through the cool breeze or wind which one feels above the head. The wind makes the head-feathers sing. Ist Canadian ed. Toronto, Ontario. M5S 2R4. Groundwood Books/Douglas & McIntyre.1999. p61. 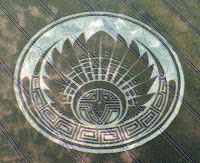 2012, Crop Circles & the Mayan Connection ! Daniel Pinchbeck's "2012 : The Return of Quetzalcoatl"